A trip to a place for Tutubi won't be complete without looking for nice places to eat that's not the usual fastfood restaurants in every corner of almost every town, even with the advent of SM City San Pablo, he wanted a different kind of experience. He got this wish during his second "official" visit to the City of Seven Lakes when he was asked by his contact on his wish on where to eat and promptly replied "I want to catch a glimpse of Sulyap Cafe and they took him there. 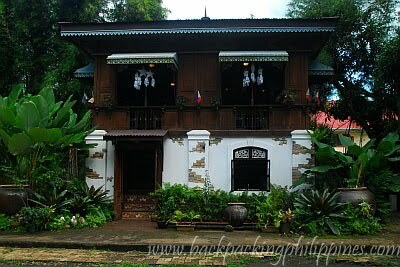 Sulyap Gallery Cafe is an ancestral house from Real, Quezon sold by its owner then transplanted to its present home. Crispy tilapia in oyster sauce. 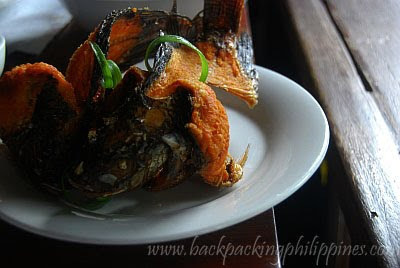 The tilapia is fried, well done with no salt; the oyster sauce with spices for dipping. The newly relocated bahay na bato soon to be turned into an inn/bed and breakfast for those looking for overnight accommodations. 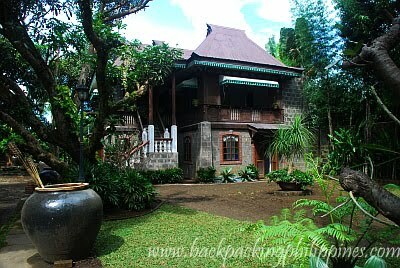 That will surely compete directly with the nearby Casa San Pablo bed and breakfast. After Sambat, Tutubi opted to go to the tour of Lake Pandin but was spoiled by a sudden heavy downpour and just decided to go back to Manila. The rafting tour of Lake Pandin occurred on his third visit. 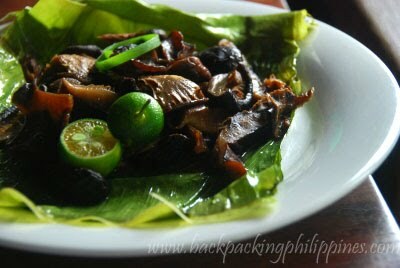 Tutubi's take: Sulyap Cafe deserves a second, third...many looks, not just a short glimpse! 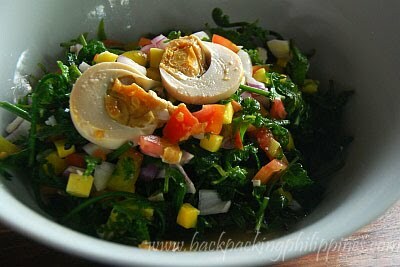 Kulawong Talong with flavor of smoked coconut meat similar to the minanok recipe of Paete, Laguna and nearby places. No reservations required but limited space available around 8 tables. Call Sulyap's contact numbers to be sure. Clydenjosh Luto sa Lawa for cheap meryenda plus the "al fresco" grills (barbeque, isaw, betamax and other street food) on the lakeshore promenade near the park. wow. we should visit Sulyap. I also want to create something like that... a sancturay where friends can stay and relax. i dont get it why people order burgers when you're in places like that? Exciting food an interesting story make your blog REAL. Thanks a lot! am a big fan of good food and nice places to eat them, I really think that this seems to be a trend of nice places where houses are turned into restaurants where you really feel the sincereness of the ambiance. I haven't been to much restaurants of the same type, but this reminded me of Pamana back in Tagaytay. Cozy place and great food.